For certain sailors, racing never stops. In winter they turn to frostbiting, braving cold winds and even colder water. Frostbiting draws hardy sailors, race committee volunteers and barroom spectators alike. 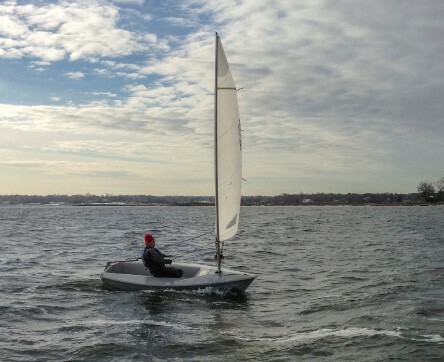 Having grown up on Long Island Sound, I have been frostbiting all my life and for the past two seasons, have been racing Cook 11 dinghies at American Yacht Club in Rye, New York. 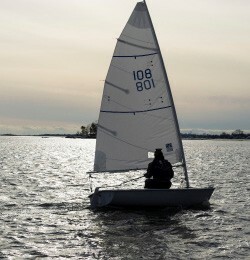 The Cook 11 was specifically designed for single-handed winter sailing. They are inexpensive, durable, simple to rig and self-bailing in the event of a capsize. They can be sailed competitively by a wide range of people with different abilities. 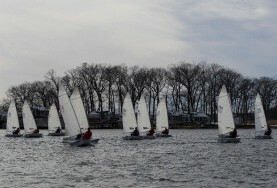 At AYC, there are typically 15-25 boats on the starting line on any Sunday. Frostbiting really is fun, but it takes a hardy breed. AYC has men and women of all ages and skill levels competing. We normally complete 100+ races per season, which gives a tremendous amount of practice with starting, mark roundings, boat handling and countless tactical situations. The best part, however, is the camaraderie within the fleet. AYC frostbiters are always willing to lend a hand, whether it is sail trim, rules or tactical suggestions, and everyone looks out for each other. The racecourse is set just west of the main dock approach and has the potential to provide challenging wind and current conditions. The harbor is exposed to the west, making a southwesterly breeze less shifty. This is also true for a southerly breeze because the Scotch Caps separate Long Island Sound and Milton Harbor. Northerly and easterly winds are shifty, to the point where boats on opposite tacks, on parallel headings, are common. In southerly and southwesterly directions, the breeze oscillates in a manner consistent with breezes that travel long distances prior to reaching the racecourse area. Since these two wind directions have a good fetch of distance upwind, I like to find the median direction in my pre-race upwind sail and time the shifts. Northerly and northwesterly breezes are incredibly shifty, so much so that it is not uncommon to see two boats going upwind on opposite tacks in nearly the same direction. In breeze from these directions, it is imperative to not get caught in the triangle below the weather mark in between the laylines. Getting caught here is sudden death. When racing in these conditions, position yourself so that you have as many options as possible going into the final 30-second countdown. At the warning, be near the middle of the starting line and then at two minutes – or one minute – before start, begin to make the crucial decision as to which side the shift pattern is swinging. Going forward, the goal is to get to that side and stay in phase after the start, while trying to minimize tacks and not miss the shifts. Easterly breezes are rare on the Sound in winter, and typically associated with bad weather and high winds. This is not ideal frostbiting weather, and often leads to racing being canceled. Not enough frostbiting occurs in easterly breeze to develop a strategy, but it is likely that the combination of long fetch and intermittent landmasses will create a breeze that is semi-shifty. When sailing downwind in puffs or good pressure, sail precariously by the lee with the boom past perpendicular and the boat heeling slightly to windward. Do not allow too much windward heel however, as this induces too much leeward helm. When sailing by the lee, the leech of the sail needs to be trimmed as if it were the luff. Installing port and starboard telltales six inches forward of the leech will provide the information needed for this unconventional trimming technique. As in upwind sailing, it is important to be in sync with both the shifts and the oscillations. Downwind shifts, on the other hand, are more difficult to determine then upwind shifts. In either scenario, the aim is to gather new information and readjust if necessary. Current is always a factor at AYC. One important aspect of current here is how it interacts with wind conditions, especially during peak flood and ebb. When wind is out of the west and current is flooding, it causes the center of the harbor to have current and wind from the same westerly direction. On the south side of the course, current flows in from the flood, coming down the Sound through the Gut, creating an opposing current direction towards the west or upwind for a third of the way into the harbor. Starting at the pin end and sailing towards the Gut and lee bow current provides an artificial lift on starboard. Then, when tacked to port, you’ll have a following push from the current. When the northerly or northwesterly winds are in play with leeward mark gates set just north of the Gut, consider the use of the northern flow of the flood or southerly moving current on the ebb tide. The gates to port and starboard can have important current flows besides what the wind shift is telling you. 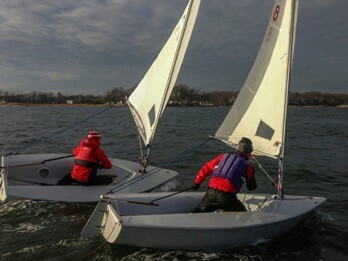 In a flood, the same current push upwind around the starboard gate creates a perfect lee bow on starboard tack to move up the left side of the course. Initially, the flood from the Gut is pushing the boat upwind and then the boat gets current from the easterly flood direction in the deeper center to facilitate a “lee bow” or ability to point slightly higher while sailing fast. The initial part of the leg has direct current push upwind and then the latter part of the final leg gets an artificial lift from the flood pushing east in Milton Harbor. The north side of the harbor has shallows in front of the Marshlands Conservancy. These shallow flats have less current. There is channel to the east of Hen Island known as Greenhaven Channel. On northerly wind days, with the mark set off the shallow marsh, one tactic is to sail straight towards the northern shore off Hen Island and, once out of the current, tack to port toward the mark approaching on port. Although not everyone jumps at the chance to go sailing while there is snow on the ground, sailing in dinghies with 8- to 15-minute races and 20 boats on the line, is exciting, educational and competitive. The thrill of numerous starts, mark roundings, tactical maneuvers, brain teasing “What if I tack now” situations, and the opportunity to use the rules repeatedly far outweigh any temporary discomfort due to plunging mercury or an unexpected swim. Milton Harbor’s challenging wind and current conditions enhance the experience and add to the excitement. Constant changes in water flow due to currents, combined with wind variables, minimize any advantage of local knowledge and allows for a racecourse where anyone can win. Frostbiting provides such a solid learning platform that it really is anyone’s race to win or lose. At every level of the sport, you are only as good as your last event and there is always someone ready to beat you around the weather mark; it keeps you striving to improve. Dave Coughlin grew up sailing on Long Island Sound, sailed in college and coached collegiately until 2000. He is the President of UK Sailmakers – New York & Annapolis.